his 35 y. old male was presented with huge swelling rt. shoulder since 2 months after mild trauma. He did not seek any proper medical advice for this period. Yesterday , he was admitted to our unit with the following x- ray. The shoulder was hugely swollen with moderate swelling of the whole upper limb . Of course shoulder movement was limited and painful. Distal circulation is OK .
Temp. 37 , WBC :10 000 and septic profile was normal. On The next day during the second survey the shoulder was examined thoroughly, then profuse bleeding from a small raw area on the axilla occurred . The patient was rushed to the OR immediately and the vascular surgery team was involved. After incision and exploration of the axilla partial tear of the axillary artery and pseudo aneurysm with huge amount of blood eroding the inferior capsule of the shoulder . This explained the huge shoulder arthrosis. The patient underwent By-Pass graft of the artery by a venous graft , shoulder evacuated from blood and other vital structures was explored and seemed to be uninjured. On retrograde study of patient data and interrogation with the relatives ; patient himself was in cooperative ; we could gain his old x- rays and got a clear history. He suffered rt. 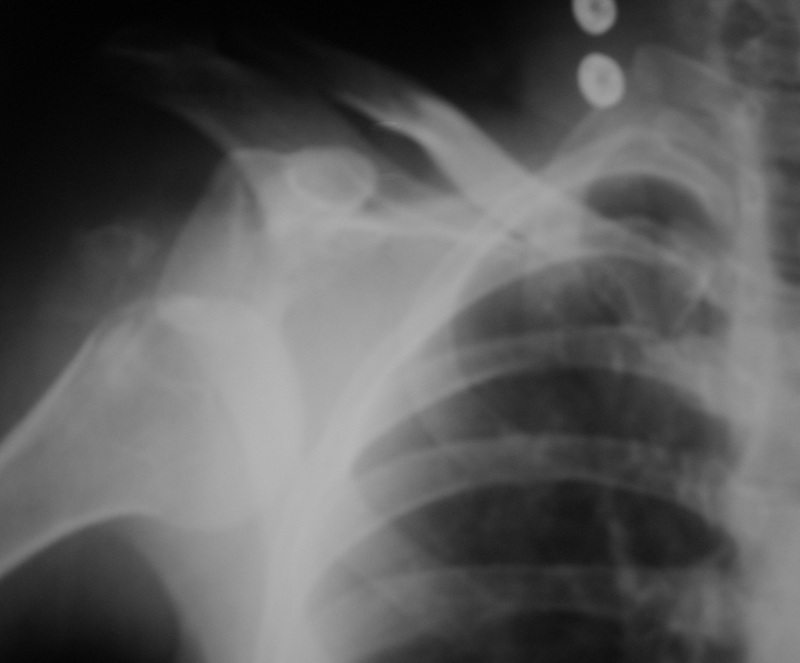 shoulder dislocation since 2 months which was reduced immediately in ER . He suffered this continuously enlarging shoulder swelling during this period for which he did not seek for proper medical advice. Patient did well after the anastmosis and no more complications occurred. He was discharged from the orthopedic ward . To our Knowledge , this is the first case of shoulder dislocation which is complicated by axillary artery tear involving in an pseudo aneurysm inside the shoulder joint .